Bruko is a brand that has always interested me. They seem to be held in very high regard by players that are far better I am. But there’s also a flip side, some people just don’t like them at all. They’re Marmite as we would say in the UK – you either love them or hate them. I posted the picture above (apologies for the quality, it was quickly taken on my mobile phone) on the Ukulele Go! Facebook page and found that I was actually bidding against Phil Doleman and luthier Andy Miles (who has a million year waiting list for his ukuleles) – two people that I’ve got an awful lot of respect for. I kind of feel bad about winning it – although I do know that Phil has since bought one and Andy ended up buying a Martin. Everyone ended up happy there. One of the main reasons that I was interested in the Bruko is the story behind them. They’re made in a small factory in Germany and have a reputation for being extremely well constructed. I’ve kind of bought into that story a little bit. Also Baz from Got A Ukulele raves about them which is always a good sign. I’ve not really had much chance to play it yet so I’ll keep you guessing on what I think – I like to play a ukulele pretty solidly for a couple of weeks before I post any kind of review. It’s probably going to be a case of one in one out now for my ukulele collection. 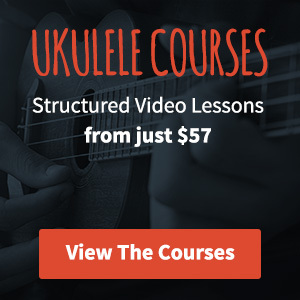 I currently own 6 ukuleles and I’m thinking of cutting down by a couple – particularly as I now own 3 sopranos and I would still like to get hold of a solid electric ukulele so I can practice at night without waking the kids up. Watch this space for the Bruko review! Hey, congrats on the new uke. I just happened to stumble across one of these on the weekend. Baz got me interested in them, but they seem to be almost non-existent in North America (couldn’t believe I found one in an obscure world music shop in town). I thought it was pretty nice and the price was reasonable too, but didn’t play it long enough to form a strong opinion. Interested to hear what you think. Thanks Glenn, it’s definitely a well constructed ukulele with a lot of TLC. Hoping to post the review around mid May if that helps. I love it. Very nice looking ukes. Maple fretboards do look odd sometimes and take a bit of getting used to seeing! Are the fretboards lacquered? Hi Sam, yeah it’s a really nice looking uke. There’s a lot of attention to detail here and it’s really refreshing to not see a rosewood fretboard for once! As for the fretboard being lacquered I don’t believe so but I could be wrong on that.